Chris Grayling has appointed two new non-executive directors to ‘strengthen the board’ of HS2 Ltd as Crossrail’s former chief executive left the Government-owned company. Dame Judith Hackitt and Stephen Hughes will become non-executive directors while Andrew Wolstenholme, who only joined last June, has left the board. 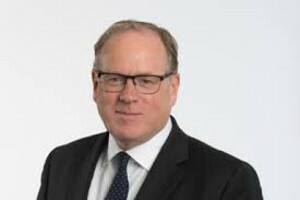 Mr Wolstenholme (pictured) joined HS2 after seven years as Crossrail chief executive, shortly before major problems with the huge project were revealed. The Department for Transport (DfT) said that both new appointees ‘bring with them a strong set of experience’. Dame Judith Hackitt was chair of the Independent Review of Building Regulations and Fire Safety and is chair of manufacturing trade body Make UK (formerly EEF). She holds a degree in chemical engineering from Imperial College, London. Officials described Stephen Hughes as a highly experienced local government leader, having been chief executive of Birmingham City Council for nearly 10 years. He is an accountant by profession. Mr Grayling also announced the re-appointment of executive directors Ed Smith and Roger Mountford for a further three years. He said: ‘The appointments of Dame Hackitt (sic) and Stephen Hughes will ensure that HS2 Ltd continues to have a world-class leadership team under Allan Cook CBE. I am also delighted that Ed and Roger will continue in their roles.